Died: November 5, 2007 in Operation Iraqi Freedom. Unit: Army, 1st Brigade Special Troops Battalion, 1st Brigade Combat Team, 10th Mountain Division (Light Infantry), Fort Drum, NY. Staff Sgt. John D. Linde of New York, N.Y. grew up in Weehawken, where he was a standout wrestler, before moving to Union City in his junior year. He and his wife met at Union Hill High School. He enlisted in the Army in October 1996 and trained at Fort Leonard Wood, Mo. His first assignment was with the 984th Military Police Company at Fort Carson, Colo. He previously deployed to Iraq from August 2005 to July 2006. He also served in Bosnia-Herzegovina from February 2000 to September 2000. His military education includes the Basic Noncommissioned Officer Course, Warrior Leader Course, Combat Life Saver Course and the Special Reaction Team Training Course. His awards and decorations include the Purple Heart, Bronze Star Medal, Army Commendation Medal, Army Achievement Medal, Army Good Conduct Medal, National Defense Service Medal, Armed Forces Expeditionary Medal, Iraq Campaign Medal, Global War on Terrorism Service Medal, Noncommissioned Officer Professional Development Ribbon, Army Service Ribbon, Overseas Service Ribbon, NATO Medal and the Combat Action Badge. John enjoyed his military career and took seriously the responsibility of protecting the soldiers who served under him. He loved being there for his soldiers and just trying to do the most and best he could for them. He is survived by his wife, two daughters and father. John died in Tal Al-Dahab, Iraq, of wounds suffered when an improvised explosive device detonated near their Humvee during combat operations at age 30. Staff Sgt. John D. Linde called home to his wife Saturday night. He would soon be off on a mission, and it was his custom, forged over two tours of duty in Iraq, to make sure his young family knew a thing or two. The first was that he would be careful. 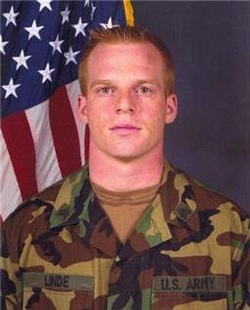 Linde, a New Jersey native, had won a Bronze Star fighting off an RPG attack on a convoy during his first tour, in 2005 and 2006. He knew the dangers and how to minimize them. The second was that he loved them and missed them. "He was able to speak with his daughter," Vilma Linde said, recounting the conversation. "We were able to tell each other we loved each other." On Monday, Staff Sgt. Linde was traveling in a convoy through the village of Tal Al-Dahab, near the northern city of Kirkuk, when a roadside bomb detonated nearby. He was one of four soldiers killed in the blast. He would have been 31 on Sunday. Linde, a military policeman assigned to the 10th Mountain Division, based at Fort Drum, N.Y., was the 86th service member with ties to New Jersey to die in Iraq. Vilma Linde, 29, said her husband was born in Secaucus and grew up in Weehawken, where he was a standout wrestler, before moving to Union City in his junior year. The two met at Union Hill High School. "He was my best friend," the wife said. "He was my daughter's best friend. They were buddies." Linde had a second young daughter from a previous relationship. The girl lives with her mother, Vilma Linde said. In a telephone interview from Fort Drum, where Vilma Linde and the couple's daughter, 8-year-old Victoria, live in base housing, the wife said her husband enjoyed his Army career and took seriously the responsibility of protecting the soldiers who served under him. "He loved being there for his soldiers and just trying to do the most and best he could for them," she said. He also loved to laugh, Vilma Linde said, and always knew precisely what to say to get his wife and daughter giggling, even when they resisted. "I think all the time about how funny he was," she said. "He made me laugh all the time." John Linde enlisted in the Army in 1996, serving first with a military police company at Fort Carson, Colo., according to a brief biography released by officials at Fort Drum last night. In 2000, peacekeeping duty brought him to Bosnia, where he served for seven months. His first Iraq deployment came in August 2005, and Linde quickly saw the dangers of the country's insurgency. His wife said he was traveling in a convoy when rocket-propelled grenades came shrieking from the shadows. Vilma Linde said she did not know details of her husband's response to the attack, but it was enough to earn him the Bronze Star. He was not seriously injured, suffering minor hearing loss, she said. "He knew all about the dangers," the wife said. "When he was deployed this second time, I knew he had the experience under his belt and that he was more aware of things. He knew what to look for." Linde returned to Iraq in September for a scheduled 16-month deployment. Vilma Linde said she is awaiting a formal report from the Army on the attack that killed her husband. In the meantime, she has had to break the news of the death to Victoria. "She's trying to be tough because she was daddy's little trouper," Vilma Linde said. "In her heart, it makes her feel some sort of peace to know that daddy's in heaven." 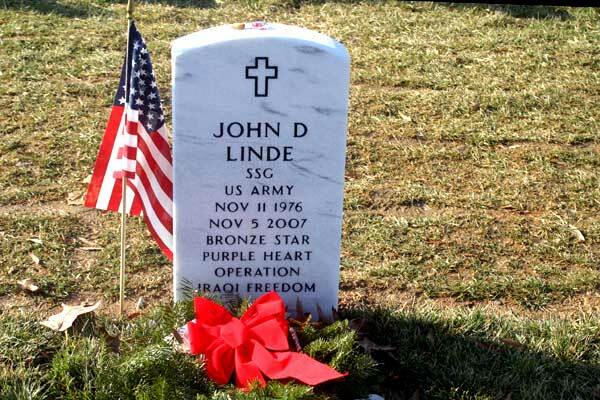 In addition to his wife and daughters, Linde leaves his father, John W. Linde, a former Union City resident now living in McDonough, N.Y.